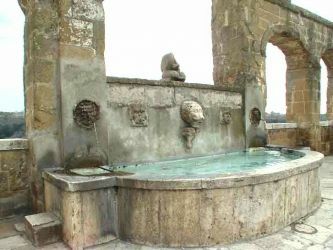 Click here to find holiday accommodation near Pitigliano. Pitigliano is famous because, unusually for a small fortified town deep in the provinces, it had a substantial Jewish population for several hundred years. The reason for this is that Pitigliano was located near the frontier between the Grand Duchy of Tuscany to the north and the Papal States to the south. The Jewish population consisted mainly of people fleeing from Rome during the Counter Reformation persecutions. 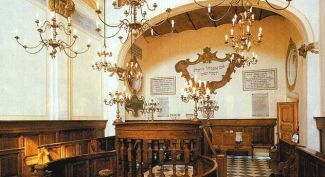 Although there are almost no Jews left in Pitigliano now, not enough to provide a quorum, the synagogue, which dates from 1598 and contains 17 C and 18 C decorations, is still officiated from time to time and was restored in 1995. Many visitors to this area explore the towns of Pitigliano, Sorano and Sovana during a day excursion, sometimes also hiking all or part of the Vie Cave at one or more of these towns. 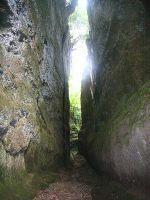 The Vie Cave (singular; Via Cava - "excavated roads"), known in Italian as cavoni, are a highly unusual road network linking an Etruscan necropolis and several settlements in the area between Sovana, Sorano and Pitigliano. These vie cave take the form of deep trenches excavated into the soft tuffa stone with almost vertical walls. Some of these roads are excavated 8 m or more into the rock. 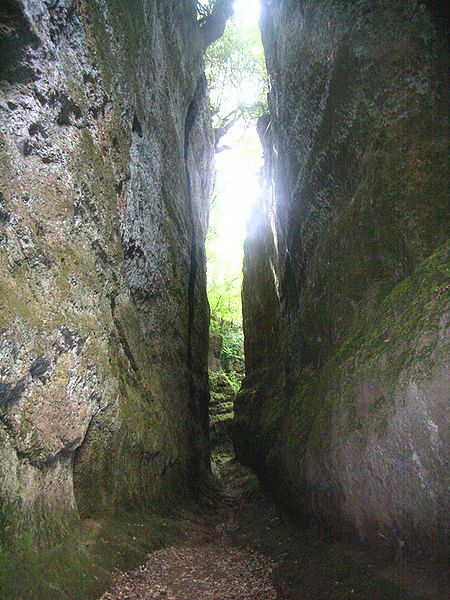 In Roman times, the Vie Cave became part of a road system that was connected to the main trunk of the Via Clodia, an ancient road linking Rome and Manciano, through the city of Tuscania, which branched off from the Cassia road in Lazio. as are Montefioralle, Loro Ciuffenna, Scarperia in the Mugello, Poppi, Cetona, San Casciano dei Bagni, Panicale, and Anghiari. Pitigliano was an Etruscan and Roman city and is sometimes identified with Vicus Torianu of the Longobard era. Reliable documentation goes back to 1061, the year in which Pope Noccolò II confirmed the possession of the parish church of Pitigliano by the Bishop of Sovana. Even though the history of the location is obscure until the beginning of the 13 C, it is known for certain that the castle had belonged for some time to the Aldobrandeschi Counts, who defended it against territorial expansion by the municipality of Orvieto. 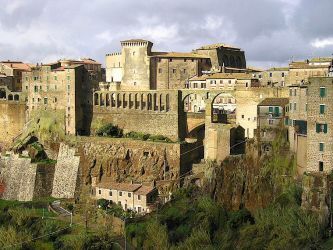 In 1274, upon division of the territories of the Counts of Aldobrandesca, Pitigliano was assigned to the branch of the Counts of Sovana, who had already made it the centre of their Dukedom. 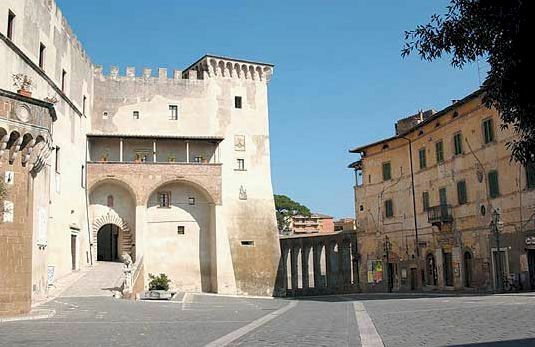 In 1293, with the marriage between Romano Orsini and Anastasia Aldobrandeschi, there began a long period rule by the Orsini over the counties of Pitigliano and Sovana, including the castles of Sorano, Saturnia , Manciano, Orbetello and Piancastagnaio. During the 1300s, the Orsini managed to maintain the integrity of their lands in the face of incursions by Orvieto and Sienna, until in 1455, at the end of long series of wars provoked by the Siennese republic over the preceding forty years, they were reduced to the territories of Pitigliano and Sorano. The Orsini were finally overthrown in 1562 by a pro-Medici faction and at the beginning of the 17 C, Pitigliano became part of the Grand Duchy of Tuscany. Pitigliano was the birthplace of Francesco Zuccarelli (1702-1788), a landscape artist and founder of the Royal Academy of London. In the Giolittiano period (1895 to 1913 - a period of fast rural development in Italy), Pitigliano developed a strong rural movement, which brought about, among other things, the cultivation of much unused land.